It is no secret that I hate Inter with a passion. I even wrote about how Karmalicious this season was back in November. I have long said that it is ridiculous how much they spent on their players compared with how much we spent on ours. And for us to be above them on the table, even if by only two spots… it’s a miracle. An exquisitely delightful miracle at that. And while I’ve long said that it was true, I finally sat down to get the actual numbers to prove it, and those numbers surprised even me. Call it a little schadenfreude by the numbers. 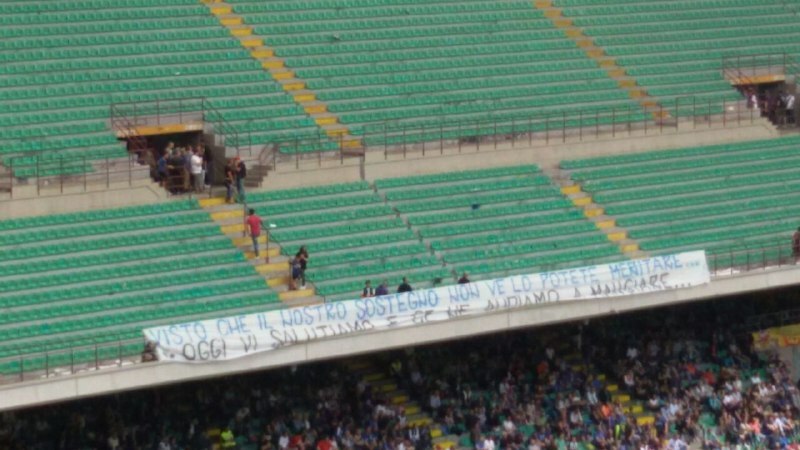 The Curva Nord told their players they weren't worthy and then went to lunch. Delicious. Let’s just jump right in with the spending. For the summer 2016 and winter 2016 transfer markets, Inter spent between €248.6 and €300m, depending on your sources. Milan spent €25-€30m, depending on your sources. Inter literally spent ten times as much as Milan. TEN TIMES. And they are below us on the table. If that is not schadenfreude, I don’t know what is. During that same time, Inter have had four coaches. They started with Mancini preseason, but he was sacked two weeks before the season started. They went with De Boer, whose results were spectacularly poor, and he was sacked on the third of November. Vecchi, the Primavera coach, stepped in briefly before Pioli started on November eighth. He actually got a few decent results out of them, but only lasted until the ninth of May. Now, of course, having sacked the coach that gave them the best results all year, they went back to Vecchi (whose name means “old people,” by the way.) With only three games in charge, he’s already lost them one, so with matches vs. Lazio and Udinese, I’m sure they’ll finish strong. I wonder if schadenfreude is a strong enough word? But their latest streak is perhaps the most fantastic. With Sunday’s defeat to Sassuolo, it marked their fourth consecutive defeat, giving them only two points from eight rounds. That equals a club record that has been met five times before, but the last time was way back in 1982. And their fans had a lot to say, too, with fantastic banners before their Curva walked away and left them on Sunday. Kind of makes you grateful for Milan’s ten points in the last eight rounds, huh? I mean even with all Milan have endured the past five years, we never spent €250m like that and then still sucked. I’m sure there’s more I could find. Like how Milan are tied for ninth in the top five leagues in Europe for playing the youngest teams. Inter are ranked 82nd on that same list (according to CIES). Or how Inter spent the second most on players in Serie A this season, but are in eighth place now, one of the most underperforming teams in the top five leagues in Europe, according to Calcio e Finanza. But honestly, when I say that regardless of where Milan finish, I will be thrilled just to finish ahead of Inter, now you’ll know why. Our dumb cousins have literally spent ten times as much as us. And if we, with our meager €25m transfer budget for this whole season, can finish ahead of them, then I will be laughing all summer long.